Warning … caveat Emptor … this is a rather long post … if it’s the recipe you are after, and to be honest it would be worth your while taking a look at it, just scoll down until you come across the photos. 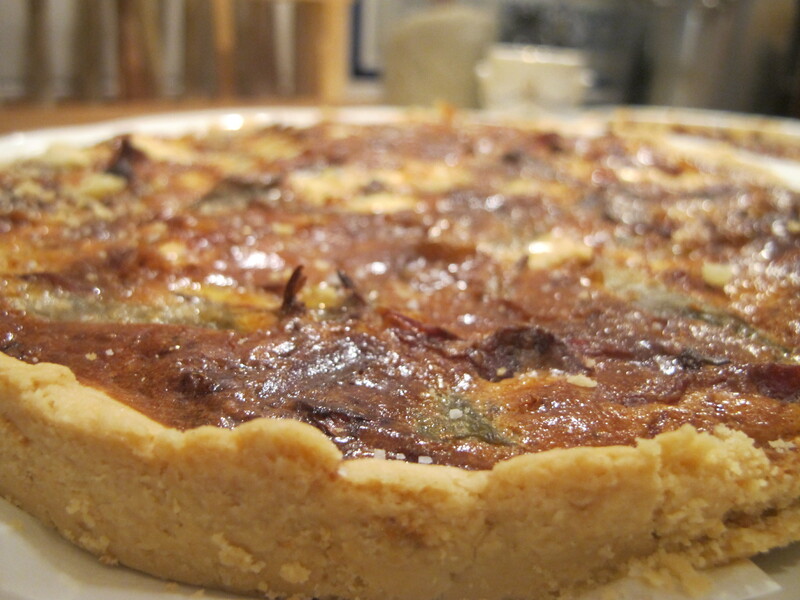 …… A friend of mine who was peering over my shoulders as I squinted over various photo albums on my computer burst out laughing when she saw the title “Quiche Semi Lorraine”. 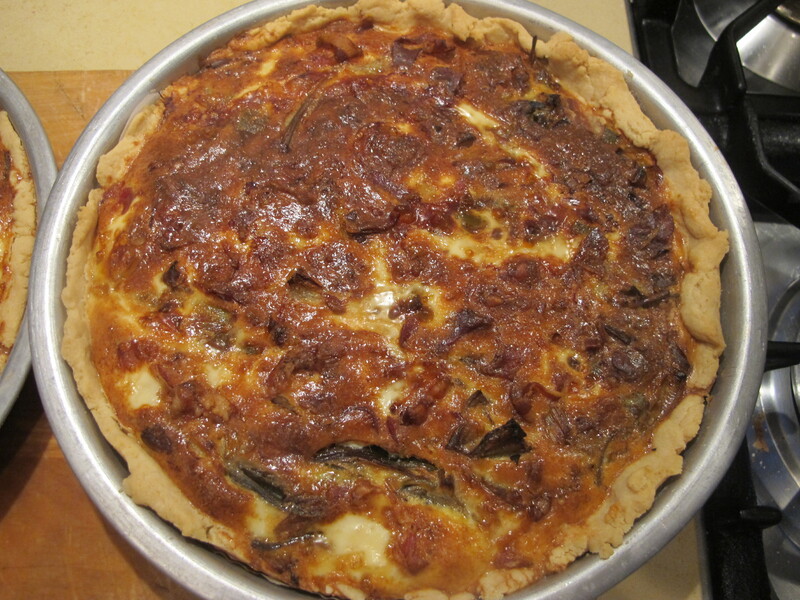 I explained that the ‘Semi’ stood for the fact that I had strayed considerably from the original recipe, adding ingredients that had nothing quiche-y about them whatsoever. That same friend got me engrossed in a conversation about Frascati’s history in general and how it had inspired restaurants and cafés to make use of its name in many parts of Europe, in North America too, the more famous ones being Café Frascati in Paris and Frascati’s at 32 Oxford Street in London (https://fynesharteharrington.wordpress.com/tag/frascatis-restaurant/). It was this same friend, journalist and local historian Emanuela Bruni, who informed me that Alexander Dumas père had compiled a Gran Dictionnaire de Cuisine (Great Dictionary of Cuisine) that even contained a recipe for ‘Gateau Frascati’. Paris was its point of creation. This gateau is not to be found in Frascati these days, nor do I believe it ever was. The mind has to wonder just why the moniker ‘Frascati’ used to be so popular and beloved during the 18th and early 19th centuries. True, Frascati had been a customary stopover for anyone embarking on the famed Grand Tour of yore, whose visitors comprised famous people and artists of the calibre of Turner, John Singer Sargent, Georges Sand, Edith Wharton and even Escher. Goethe referred to it as a ‘corner of paradise’ and I would agree with him. I have a passionate love for Frascati, my mother’s home town, in that ‘warts-and-all’ fashion and have suffered as I witnessed the slow but relentless battering it has taken due to the the economic dip and recession of the last seven years. Ever the optimist, I can safely say that a turning point seems to have been reached last year and that there are signs in plain sight in this town, in this area, pointing in the direction of recovery. The one sector that thankfully showed little sign of suffering during this same period, on the other hand, has been the wine production sector and the evolution of the quality of its wines. In 1966, the Frascati denomination had been one of the first Italian wines to be awared a DOC (Certified Denomination of Origin) status and was always loved and greatly indulged in, down the road in Rome as well as all over the area of the Alban Hills. Bottles of Frascati wine were reputably to be found even in the wine cellars of Buckingham Palace! When production exceeded quality during the 1970s, however, Frascati’s wine reputation was inexorably and justifiably blotted. In recent years, wine growers have gone to great lengths to remedy the situation, thanks also to the efforts, work and resolve of the Frascati DOC and DOCG Wine Consortium, and the time has come, say I, hands on hips, to scotch the former tainted reputation. I certainly hope that Frascati wines are again to be mentioned with the respect they deserve when they will be showcased at the Milan Expo this year. Frascati wines have one advantage over other … all be they excellent … wines from the rest of Italy: they pair with Roman cuisine beautifully. Now, I love pairing bubbly with porchetta … so don’t get me wrong, Frascati is not the ‘only’ wine to accompany hearty Roman dishes. That said, Frascati is one of the rare wines that will ‘work’ with artichokes the way few other wines can. Huh. Goodness me, the sommelier classes I took (and did not finish, mind you) imparted a grave lesson as to the sheer severity of artichokes on the palate … such a bitter taste, Oh woe is me!, and they all but told us that wine could only jostle against this ‘ingredient’. Excuse me? There is something orgasmic about artichokes and there is no way people are going to refrain or abstain from eating them just because wine experts tell us that there is a huge problem finding an appropriate wine to play duet with them. All I can say is that … you really could do worse than pair a good Frascati wine with your next plate of artichokes, cooked the Roman way. And now onto the whole purpose of this post. “Finally”, I can hear you sighing. 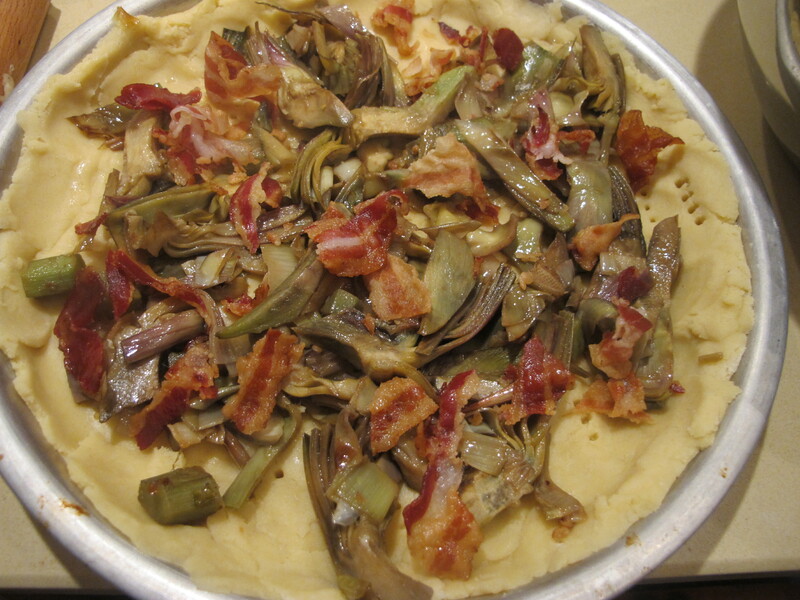 My ‘take’ on quiche … includes guanciale (pork jowl) and artichokes … and because these ingredients are so typical of Rome and this part of the world, and my beloved Frascati, I have decided to name this dish: (roll of drums and trumpet call) …. 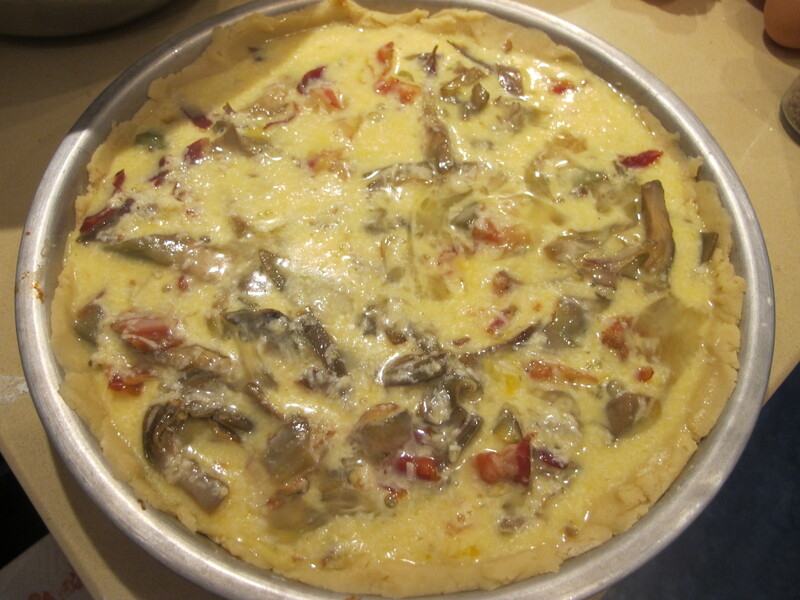 Quiche Frascataine. I do hope you enjoy it, if ever you should feel prompted to have a bash at it. 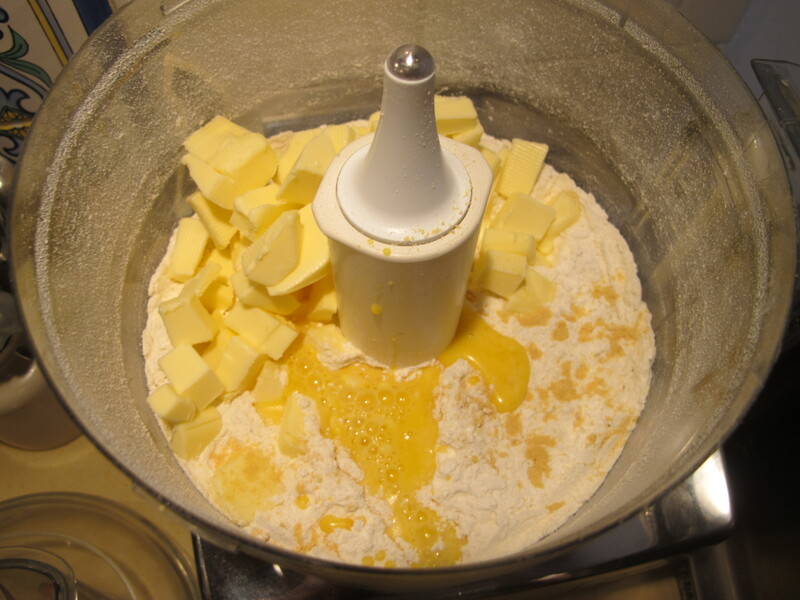 For the pastry: 400g flour, 200g cold butter diced into cubes, 2 tablespoons cold water, 2 eggs, pinch of salt, pinch of English mustard powder. Extra flour for dusting. 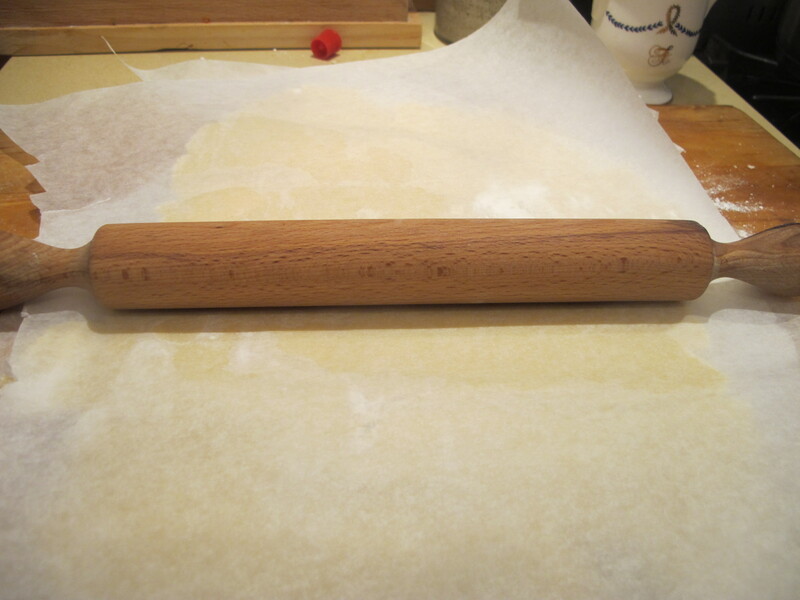 Rolling pin and greaseproof paper. 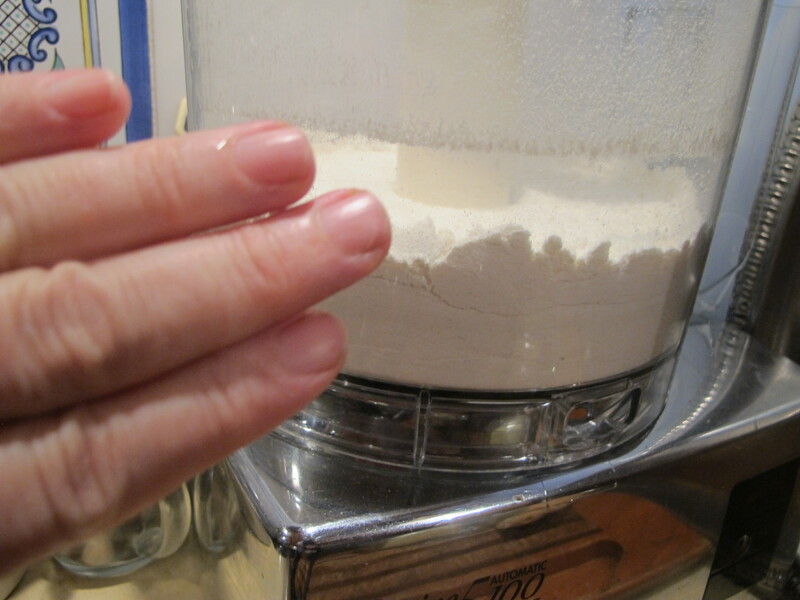 400 g of flour … I used the Italian ‘O’ kind. 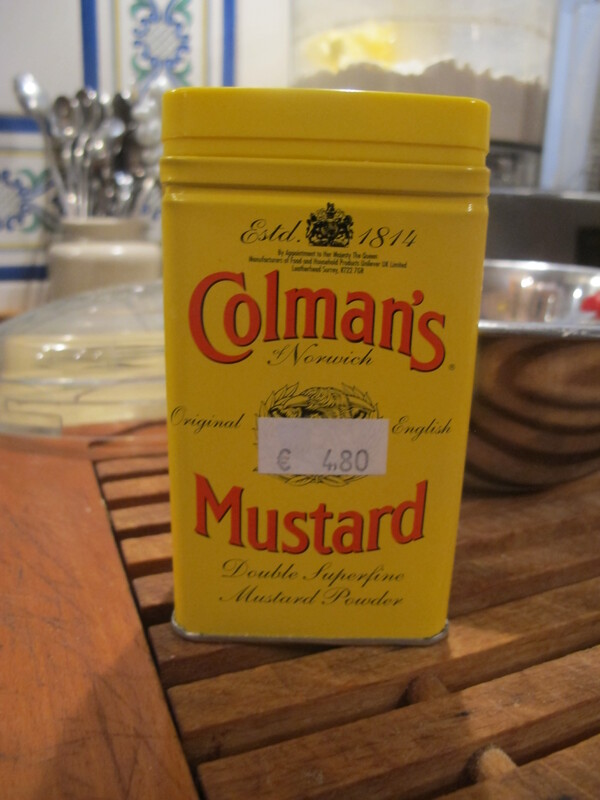 200g diced butter … 2 eggs, 2 tablespoons very cold water … Pinch of English mustard powder (not vital, so don’t worry if you don’t have any) … Pinch of salt … and freshly ground white pepper … Use the ‘pulse’ function on your food processor. You don’t want a ‘mush’. 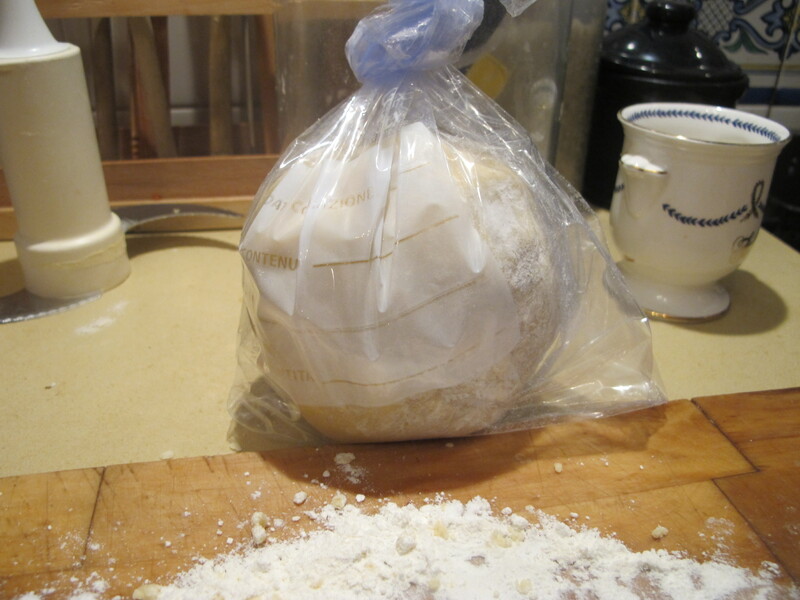 Make a ball with the dough … cover it in some flour … and then envelop it in a plastic bag. 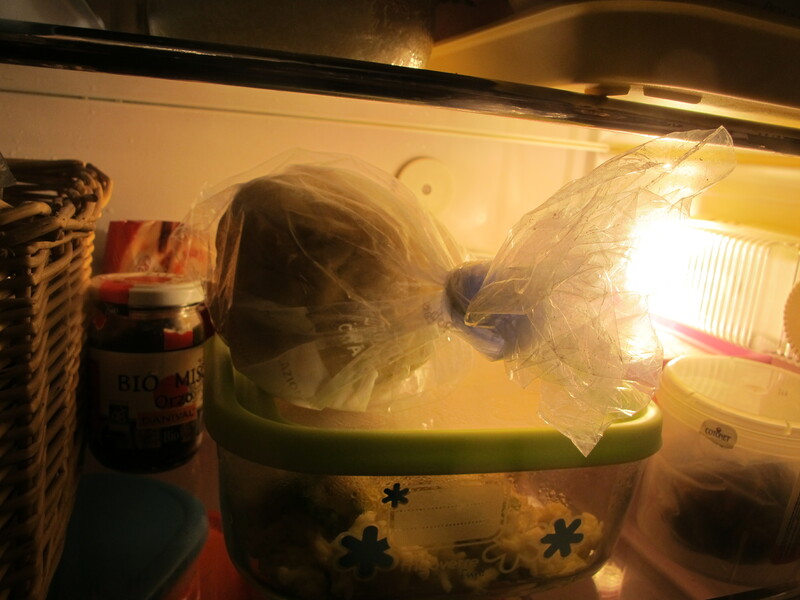 Place the dough in the fridge for at least 1 hour … 2 would be even better. All right … time for confession. 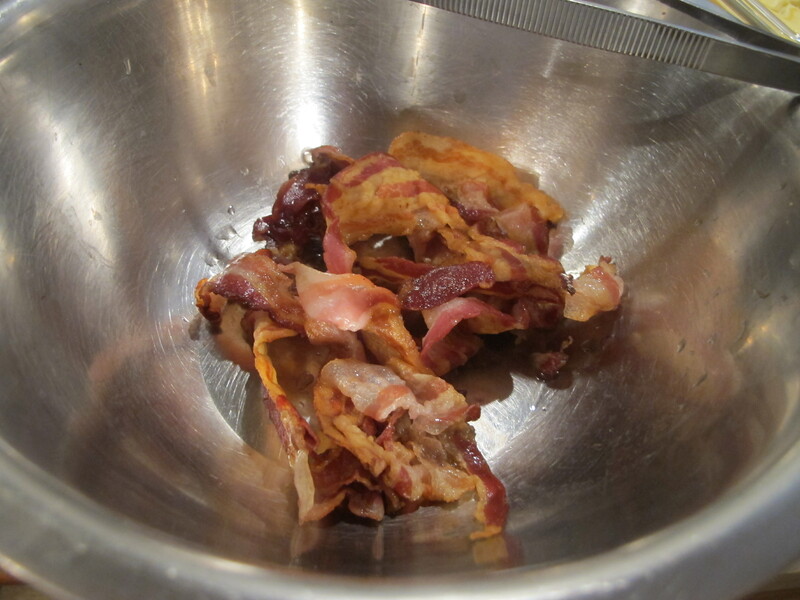 I didn’t have the usual guanciale (pork jowl), or even pancetta in the fridge … so I resorted to … bacon. 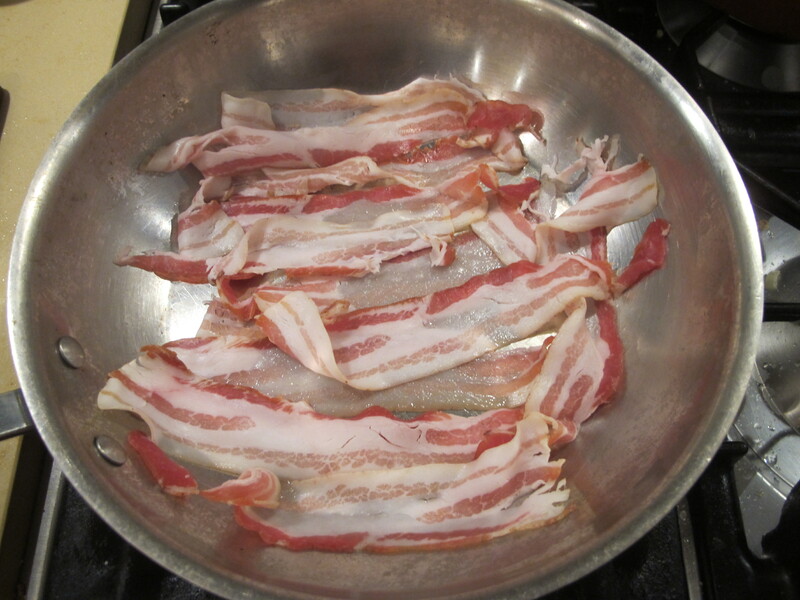 I love bacon anyway … so no problem. 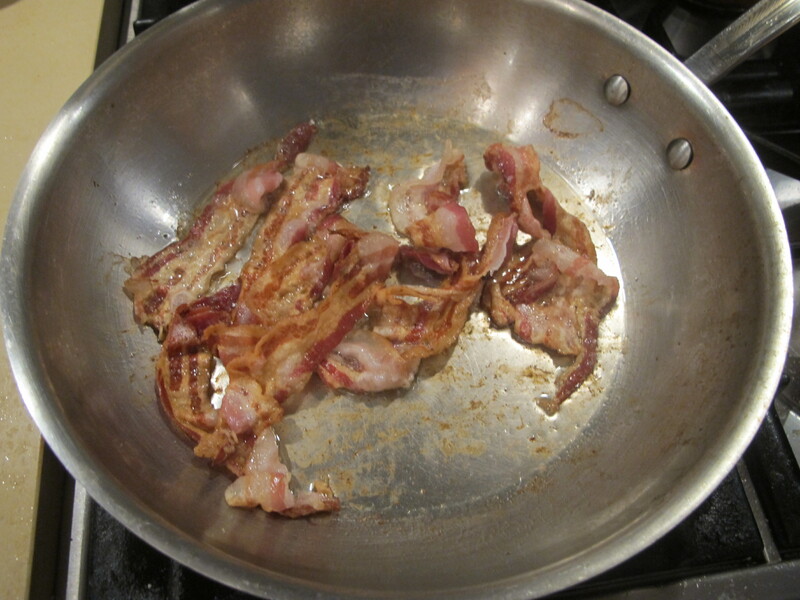 Cook the slices of bacon over a moderate heat, without adding anything … When the bacon crispens up … Remove the bacon, and set it aside. Artichoke party time ! Party my foot! 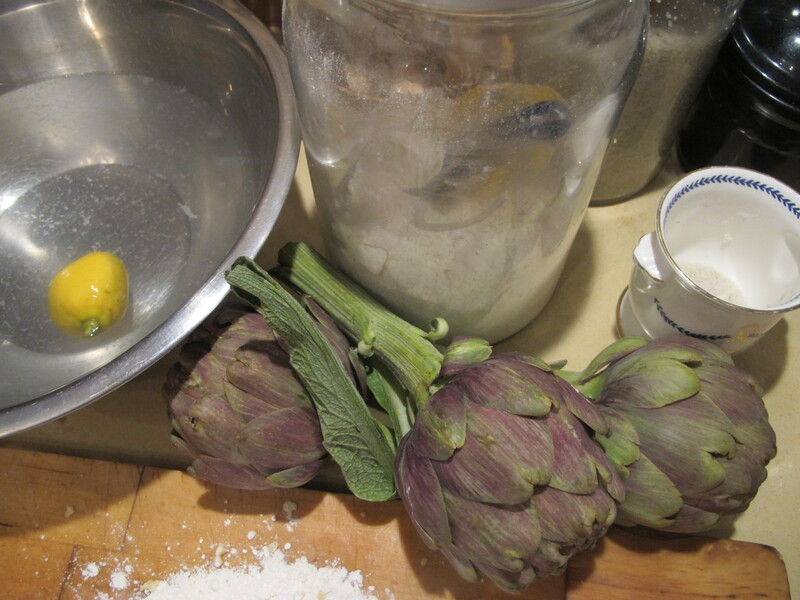 artichokes are a lot of work, it takes more time to clean and trim them then it does to cook ’em. So remove all the outer leaves … bla bla bla … you know the routine. If you don’t, please email me and I’ll tell you. 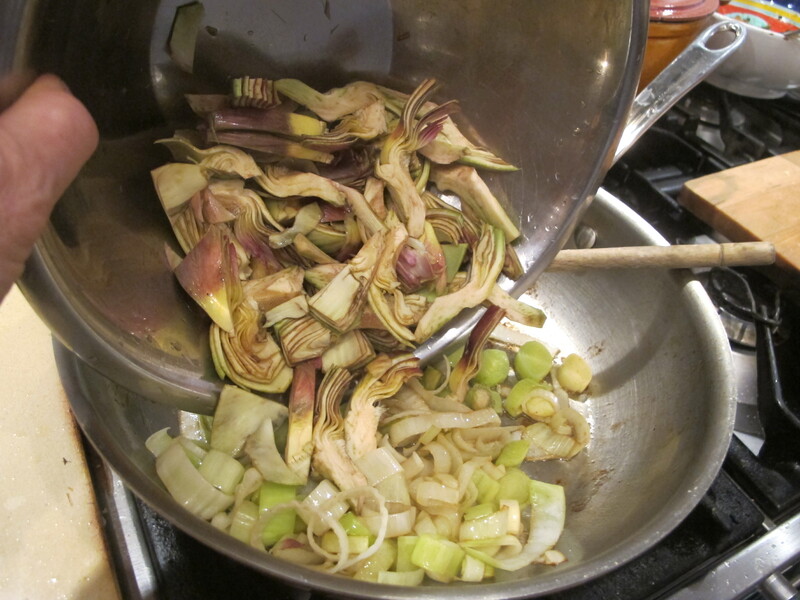 Slice the trimmed artichokes fairly thinly … See all the lovely fat that the bacon left ? 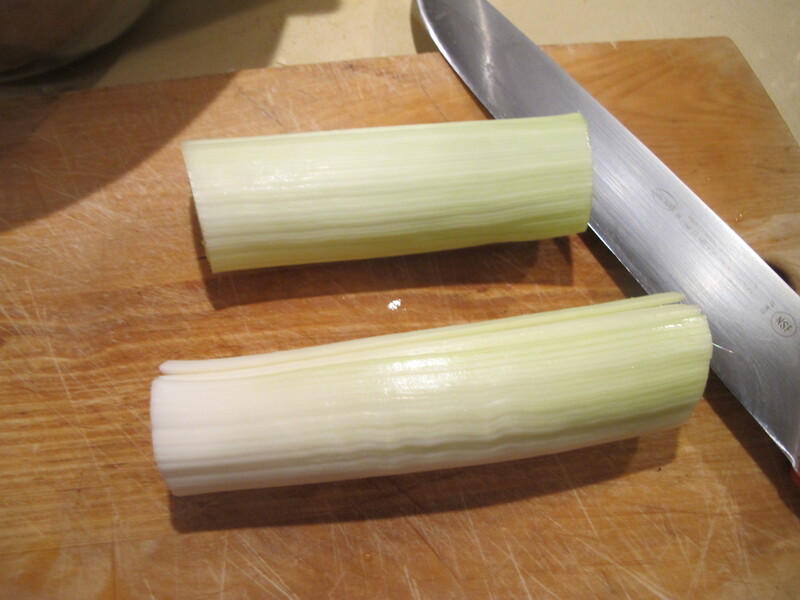 One, very large, leek … Cut the leek in rounds and cook the rounds over a low heat in the bacon fat (more appropriately pancetta or guanciale fat, if you have access to either of them). 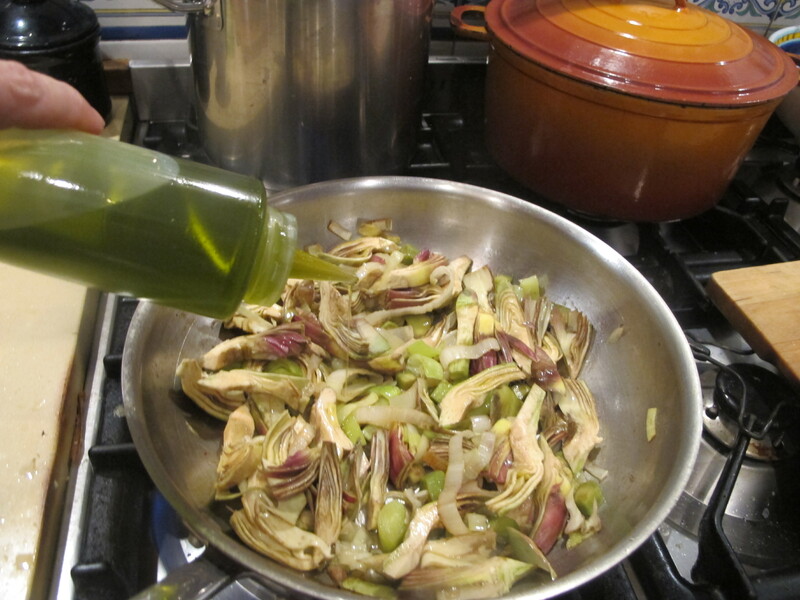 Add the sliced artichokes after a while … I could see there were signs of ‘drying out’, so I added some evoo … (will you just take a look at the colour of this evoo? It’s the Quattrociocchi brand, if you want to know … and no wonder they have won prizes for best organic olive oil at international competitions! I am so proud … because this is an olive oil that hails from Lazio ! ) Okay, ahem, excuse the excess of my enthusiasm… Where was I? Ah .. yes …a pinch of salt. 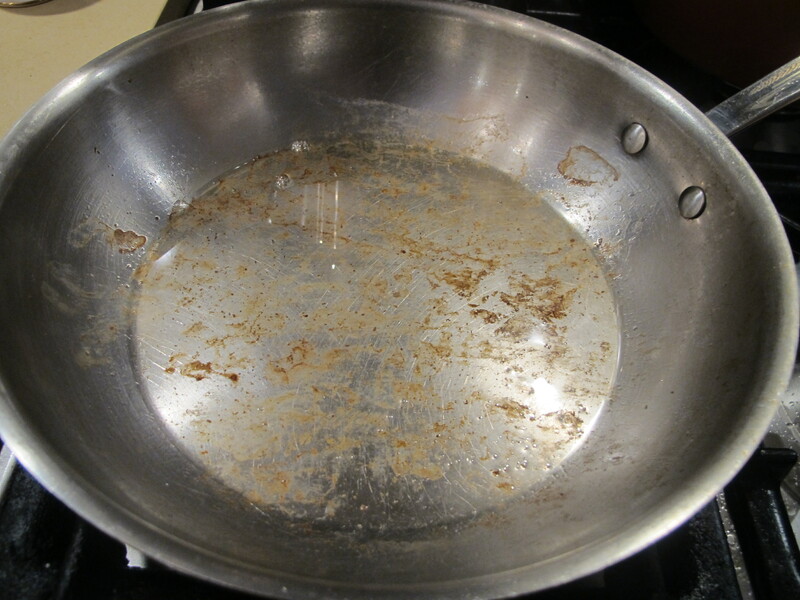 You literally cannot get a dish to taste the way it ought to … without salt. And the quality of salt is most important. 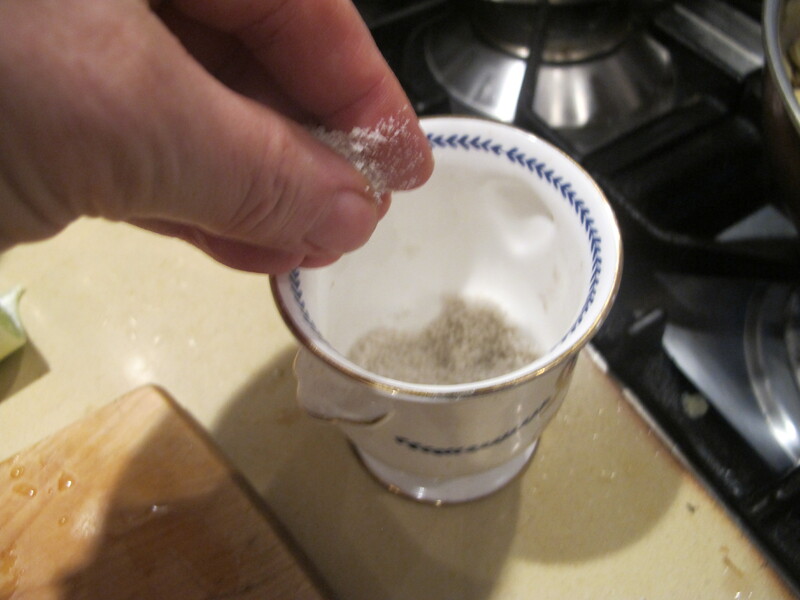 I tend to use Celtic (grey) salt most of the time … from the Atlantic Coast of France. I love Maldon salt on meat … and I love the naturally dried whole salts from Italy’s Cervia on the Adriatic and Motthya in Sicily … Sea salt does it for me … others would prefer the pink Himalayan salt. 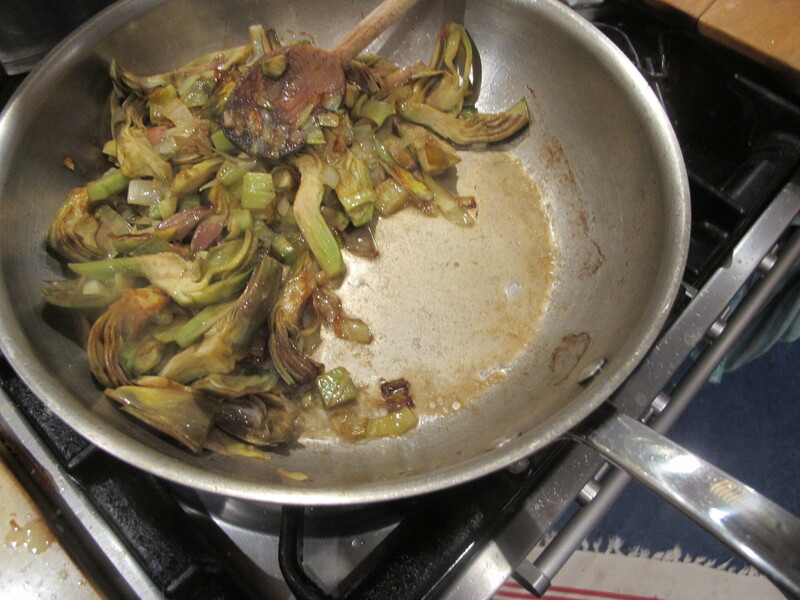 As the artichoke slices cook, they can get a bit dry … The thing to do is edge over the artichokes to one end of the pan … and add a little bit of water to the pan on the other side. Avoid pouring the water directly over the artichokes, in other words. 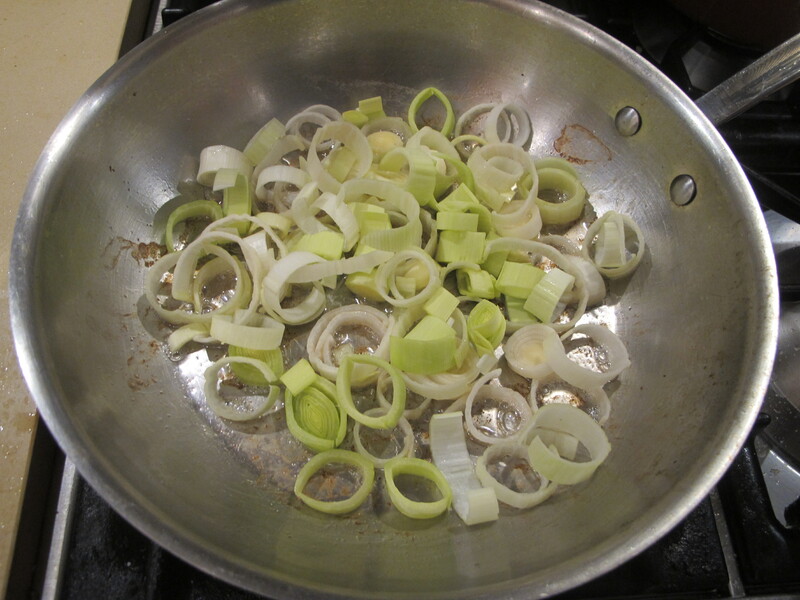 Once the artichokes slices are cooked, remove from heat and set aside to cool. 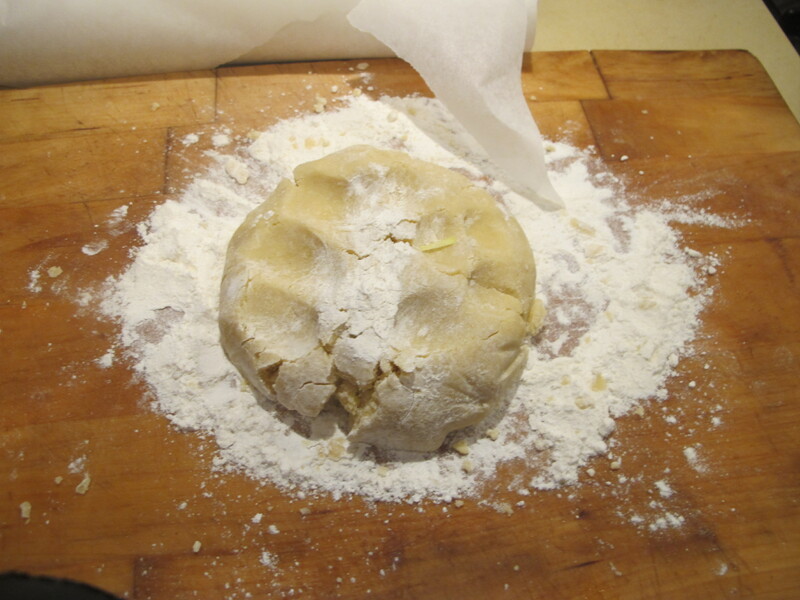 STEP III – PLAYING WITH PASTRY Take the pastry ‘ball’ out of the fridge and cut it in half … Punch down one half and roll it in a bit of flour …. and do the same with the other half. 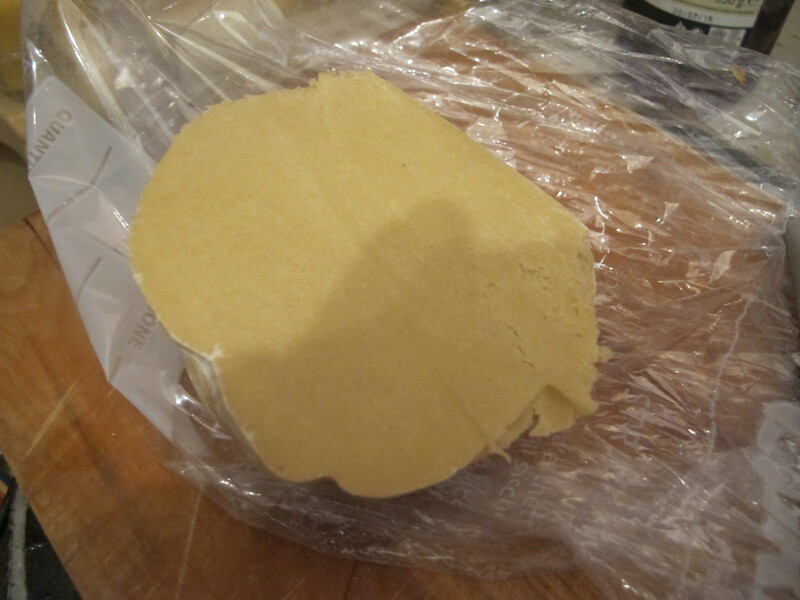 Place the dough on one sheet of parchment/greaseproof paper … and then cover it with another sheet. A sandwich of sorts. 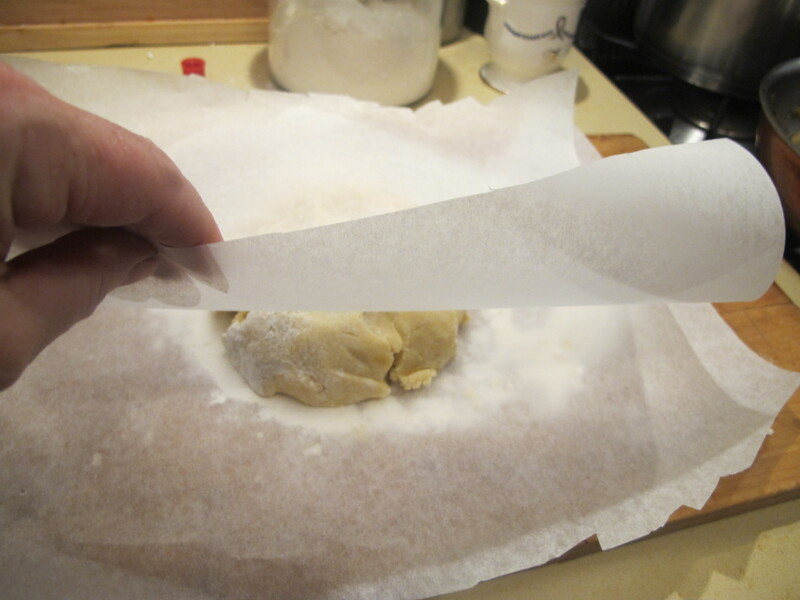 Use a rolling pin to flatten the dough … Because the dough is encased within two sheets of greaseproof paper, it won’t ‘stick’ and be nasty to have to deal with. 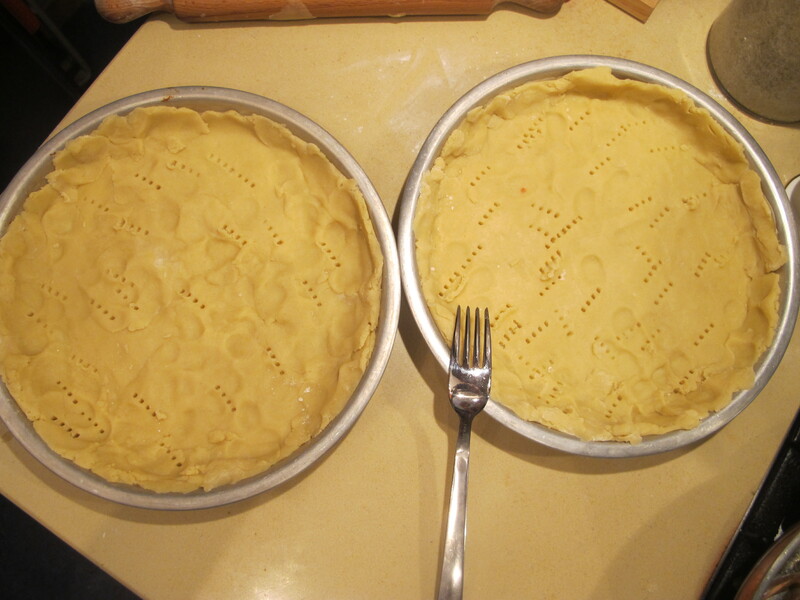 Place the rolled out dough inside two round, butter-greased baking trays. Use a fork to prick and prod and and if you are upset with anyone … here is your chance to let off some steam, pretend you are having a ‘go’ at them and be ruthless with your fork. 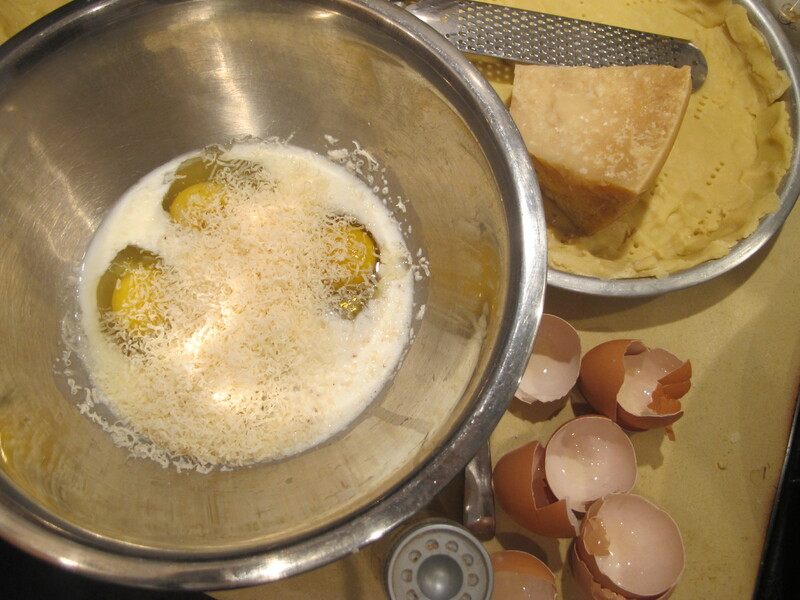 You will require … 4 whole eggs, a good amount of freshly grated parmesan cheese and 100ml of milk for each of the two quiches frascataines. A pinch of salt and a twist of nutmeg. 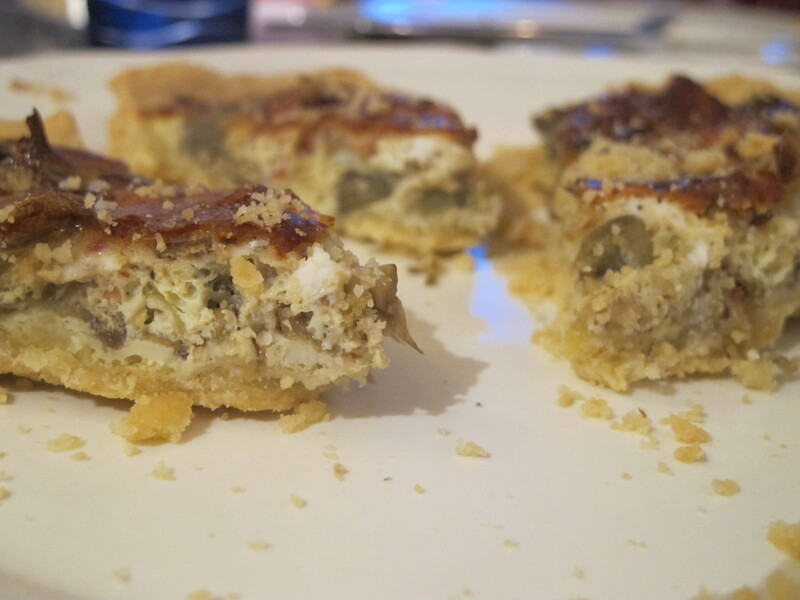 Next time, I will add cream too … Place the cooked artichokes and bacon bits inside the pastry casing … Add the egg and milk mixture … and bake in a pre-heated oven, for about 45 mintues at 180°C. I found that I had to bake it for almost one hour … this could depend on many a factor and you will have to be the best judge of your oven ‘baking power’. 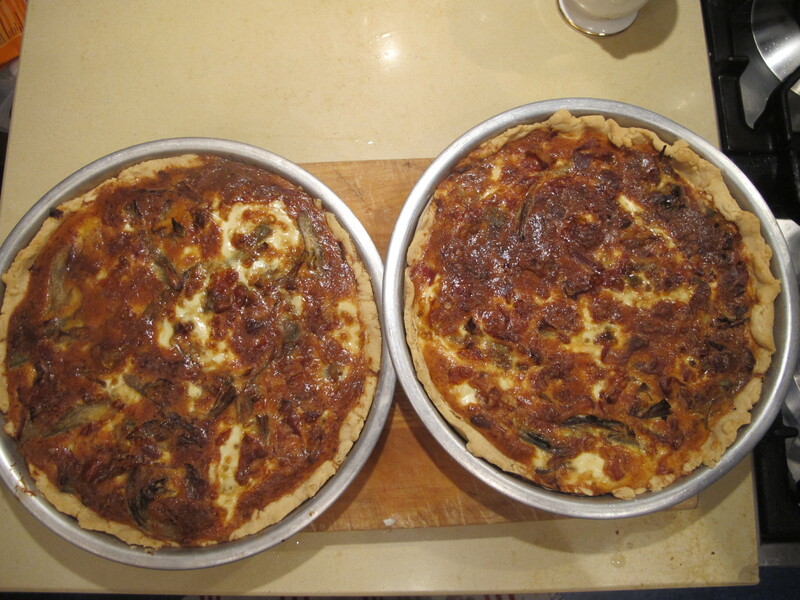 Out of the oven and smelling gorgeous … On a round serving dish … About to be sliced … And frankly … buonissima ! 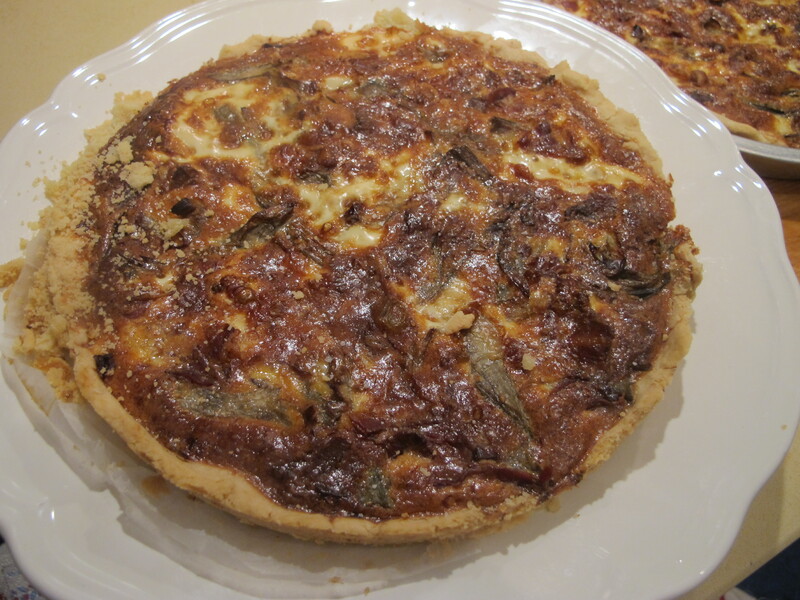 Quiche frascataine is to be enjoyed with a good quality Frascati wine … I insist! This entry was posted in italian home food, Recipes from outside Italy, Travel and Tales and tagged Alexander Dumas, artichokes, Café de Frascati Paris, De Sanctis Abelos wine, Edith Wharton, eggs, Emanuela Bruni, English mustard powder, Escher, evoo, flour, Frascati, Frascati DOC, Frascati wines, Frascati's at 32 Oxford Street in London, Gateau Frascati, Georges Sand, Goethe, https://fynesharteharrington.wordpress.com/tag/frascatis-restaurant/, John Singer Sargent, leek, Michelle Smith, milk, Quattrociocchi Olive Oil, salt, sea salt, Turner, www.easyfrascati.com. Bookmark the permalink. Off to bed now Libby … missing you in the kitchen … I love the way you cook ! Hurry up and come soon ! This looks great, Jo. 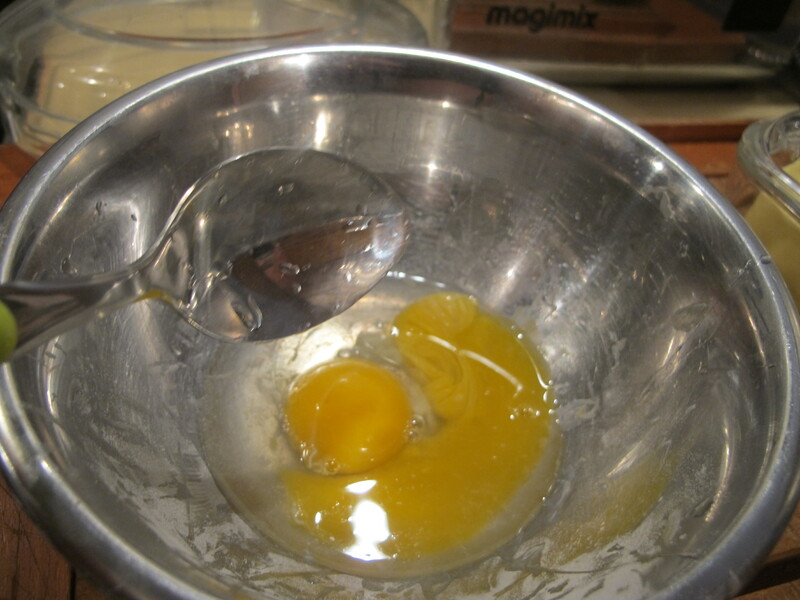 I hate making pastry so maybe I will just wait and you will make it for me when I visit. 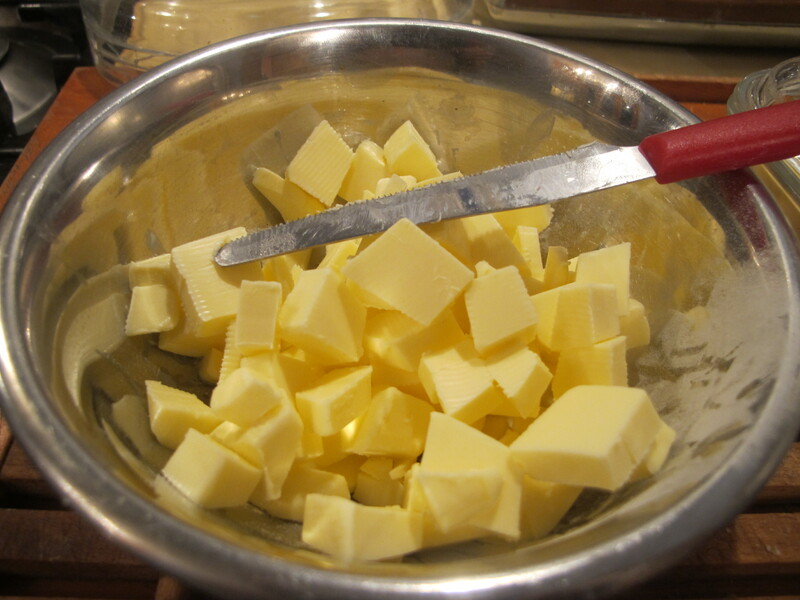 This is the only pastry I know how to make ! 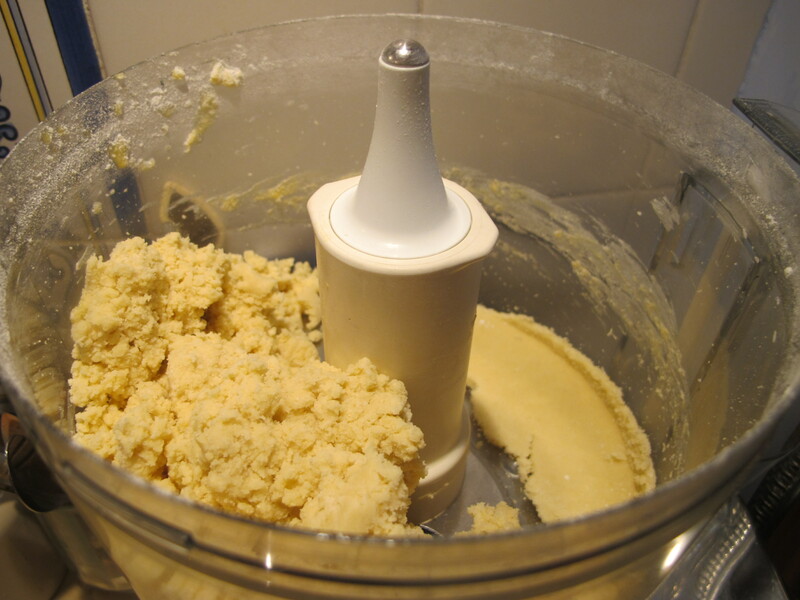 and there is a bit of cheating going on because I use the food processor. 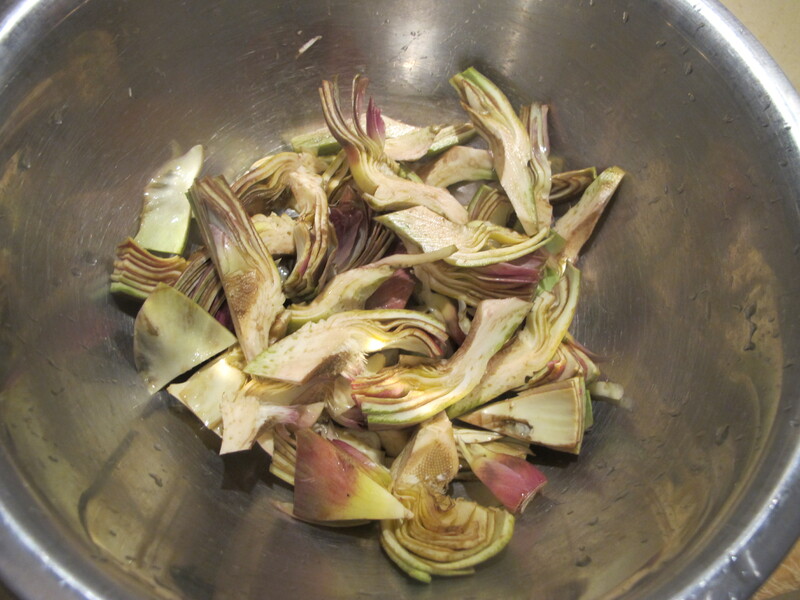 Carciofi will still be around when you come over, can’t wait ! The post was great. I read it all with delight. I’m beginning to hunger for artichokes, and this dish seems divine. Great job, Jo. 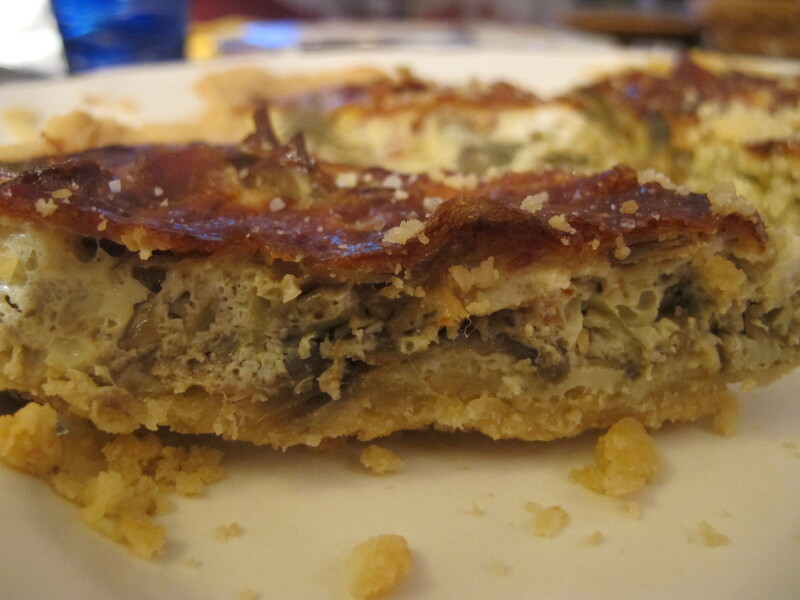 Shame artichokes won’t be in season when you return … but we’ll make up for it with something else, yes? Thank you for your compliments … it is actually not very hard to prepare (otherwise I wouldn’t be making it!). I love your posts… Turn them into a book…..! Thanks fir this and for mentioning me. Sweet as always. Thank you Michelle … and I would love for you to guest-post on my blog one of these days … you know so much about Frascati wines and the history of our beautiful Castelli. jo, as ever you mange to be friendly, informative and humorous. this looks excellent and i will make it the minute i get to house in france next week. auguri! Oh thank you Penny ! Safe travels, hope the weather melts into Spring! I think we are ready to bid adieu to Winter, no?